Two Bears Farm and the Three Cubs: Muffin Tin Monday - Leftovers Rock! Muffin Tin Monday - Leftovers Rock! Today's theme for Muffin Tin Monday is Leftovers Rock. They do in my house...we eat a LOT of leftovers! 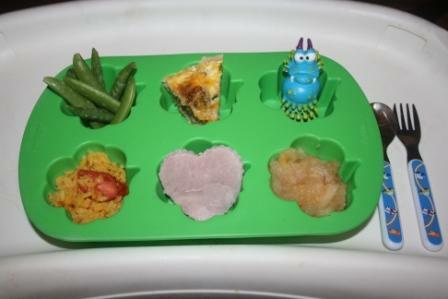 Sugar snap peas, a tiny piece of stuffing/sausage quiche, a germ, spanish rice with cherry tomatoes, a heart shaped piece of ham, and cooked apples (cooked from our apple tree and frozen last fall - they still taste just as fresh as straight off the tree). Yes, a germ. Circa late 80s. It's a leftover of sorts. A leftover toy from my childhood. How wonderful to have your own apples to eat! The germ is cute. i didn't do a mtm today. i didn't get a chance. but i clicked all the way over here... and what did i get? confusion. that's what. i mean. 4th - you changed your banner. I love the germ! How fun. I love the Germ! I need to get one of those..My 3yo DS always says, "germs and bugs" when I ask him, "what do you want for lunch" I would love to get a "germ" to put on a plate or in a tin for him..what a great picture. Thanks for sharing! LOL Love the germ! Too cute! I am drooling over the apples though! I wish I had an apple tree!